That was interesting. It shows a large number of the self employed are part time, and earning as much or more from employment as self employment. That means the government's assumption that a self employed person is a full time person is nonsense, to be polite. It is also quite remarkable that one sixth of all self employed people are also in receipt of a pension. The income of the self employed earning less than £100,000 fell over this period. Over the period this rose, of course. Only a little, but it did rise (and band inflation given the overall rate of earnings inflation during this period is not going to explain this). First, if mean pay is about £20,000 then 91.5% of self employed people earn mean pay or less. Second, if two thirds of median pay is a measure of poverty (or £15,000 or less here, at least) then 84% of the self employed would be in poverty based on their self employed earnings and 77% are based on total income. 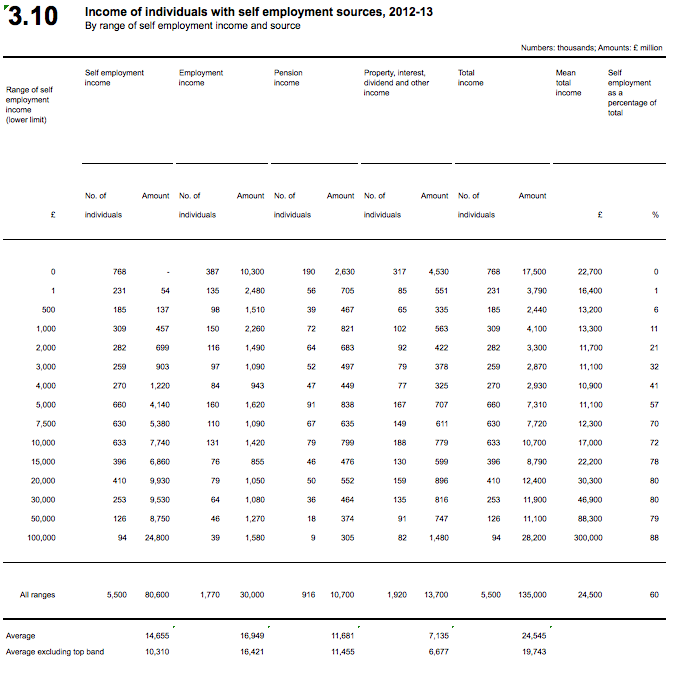 Third, the top 1.7% of self employed earners make 30.7% of all self employed profits. And the average earnings of a person in the top 1.7% income bracket of self employed people makes 25.5 times more than the average for all other self employed people. If this is a market based solution to inequality it very clearly fails. Although I would add, I suspect all these figures are understated because of tax evasion, but right across the board. I haven’t seen the latest figures but it appears that the less scrupulous DWP contractors have probably been persuading claimants to go ‘self employed’ for the tax credits. In due course (after the election, naturally) HMRC will come looking. If Labour gets in, they will get the blame for the rise in ‘unemployment’. If the Tories get in then the contractors will get the blame. The Universal Credit timebomb is coming in so many ways…can you give a link on info about the benefits repayments? Thanks. Job Centres have become colloquially known as ‘sanction centres’. people become self-employed because they can no longer stand the harassment and perpetual fear of the food bank/destitution. It is designed to drive wedge between those suffering in-work poverty and those on benefits -and with the help of the economically illiterate mainstream media it’s worked! Let’s not forget Duncan-Smith’s Work Programme Providers who get bonuses for pushing claimants on their books into ‘self-employment’. I strongly suspect myself IDS remains in his position only because it’s his fiddling of the figures which have allowed the Coalition to make their claims about ‘recovery’ and the entirely fictional ‘jobs miracle’. Nailed it: I could repeat your point, but you’ve got better quality data. And this is why I wrote to you about VATMOS. There are a significant number of people in the community in which my wife circulates (wool and knitting) in doing little bits of work to keep the wolf from the door, possibly also to fit around responsibilities like caring for children or elderly relatives. That might be designing patterns to sell, or making up. VATMOS and its onerous requirements have knocked a good many out of business. I wouldn’t mind betting that there are other sectors that have seen the same. It’s only ridiculous if you regard its aim to actually be that and not to help create a permanent underclass unable ever to improve their circumstances through work. If they never get off the ground, they’ll never be competition for Apple or others high on the totem pole in the existing order. It underlines and reinforces the existing status quo. I did say that would be the aim of this government a good while ago, if you recall. Similarly, in UC the self-employed are regarded as earning a basic minimum wage for a full-time week and that sum is deducted from any benefits they might receive. Since many won’t be earning anything at all, what this measure will actually do is make it impossible for poor people, and UC is supposed to be covering everyone remember, to get started in self-employment the way they can now. In practical terms this is going to limit self-employment to the wealthy or those with connections who can support themselves through these difficult first years. Again we see the creation of a permanent underclass here unable to improve their circumstances through industry. Then there’s the Work Programme, known to be less than useless with regard to getting claimants into paying work yet carried on and increased regardless. Why? I suggest because it has the practical effect of stopping claimants finding paying work because all the entry-level jobs are being done by themselves for free. Again, the effect is the creation of a permanent underclass who can’t get on through work. I suggest this is the real aim of many so-called ‘welfare reforms’. If I’m wrong, well, there seems to be an awful lot of smoke without fire here. I should point out that three companies known for monopolistic and exploitative practices towards independent musicians, writers, and software developers have lobbied – highly effectively! – for creating a European market in which all small businesses selling electronic content are compelled to sell through a handful of platforms that have multi-million dollar software systems (and the regulatory deals in place) for VAT administration. I thoroughly approve of their being forced, at last, to pay some VAT. But I have several writers and musicians among my friends and I am reminded that I should be careful what I wish for. I suspect that the largest single group of self-employed people earning over £100,000 per year are IT contractors. Few would pass any challenge to their ‘sole trader’ status that compared their working conditions to that of salaried IT staff at an adjacent desk, working at the same office as their ‘client’ or ‘customer’. Rates for Developers, Business Analysts, and Project Managers run from £400-£700 per day in banking, and about 30% lower in all other sectors. This government with its austerity has had a dramatic effect on our industry both for us self employed and for the employed, they have to go IDS and his universal credit have no place in a civilised uk. the Tory agenda really is inhumane and will cost lives, it has already almost cost mine a suffered a stroke in september, I already had a condition Wegner Granolomotosis which requires A GOOD DIET, as part of crisis help my council sent us to a food bank this has caused masive problems with my gastrics has tinned food does not have the required dietry goodness to support recovery. from my illness. They have taken my money for 45 years, I feel cheated.